Today, a nursing assistant can have varying choices for CNA career advancement options from becoming a licensed practical nurse or LPN to becoming a Nursing home administrator themselves. If you are planning to have a higher-paying position or would like to earn more responsibilities in a nursing home, these options will definitely provide you with the outlet that you are looking for. They require additional experience as well as formal education so you have to be ready to meet those challenges. Aside from this, you will also be required to practice more diligence and commitment to your job. In some states where CNAs are allowed to administer medication and IV as well as work in geriatric care, there are programs which will help you advance to these positions. They usually entail a few weeks of training in order to earn the additional certification which is needed for such tasks. Take note that not all states in the US allow nursing assistants to do these jobs, so this will depend on where you are currently working. These certifications are usually considered as advanced courses and will also mean added income for the CNA. The next step is the CNA to LPN path. One can work as an LPN with an Associate’s degree in nursing which usually takes only two years to complete. Gaining a nurse aide license as well as sufficient experience will usually earn some credits on your LPN course and this can mean lesser expenses for the education. 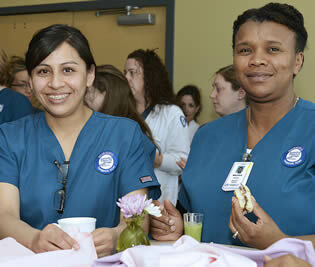 A lot of institutions honor nurse aide credits and this will often shorten your required education in an LPN course. Getting an Associate’s degree in nursing will give you a higher position in a nursing home and will also provide you with other job opportunities in other medical facilities. Aside from this, some CNAs proceed to gaining an RN or Bachelor’s degree in nursing in order to ensure a higher salary or to earn more skills for a higher position. Some of the downsides to this option is that most nursing courses would not take the credits that you earned in certified training and even your work experience. The best that can happen is that you can earn a few credits for your course. You will still need to undergo the 4-year education in order to gain the nursing degree. The perks however are great. Once you earn a Bachelor’s degree, you will gain more job opportunities and your chances of getting hired are also increased. You can read more about what you need to do to become a nurse on this page. Many who receive an RN license decide to become CNA instructors which allows them to teach others how to receive their certification to work as certified nursing assistants. To qualify one must hold a current RN license as well as have two years of previous experience in the medical profession. Earning advanced training and education will often be your ticket to different CNA career advancement options. Visit this page to find a full list of medical jobs that can potentially be in your future.